The central government has agreed to provide financial assistance to Himachal Pradesh for strengthening transport in the state’s remote areas. Minister added that the State government would send a detailed project report to the Union Tribal Ministry highlighting the need to strengthen the transport infrastructure in these areas keeping in view of the tough geographical and topographical condition. He said that road network is the only connectivity source for entire tribal belt in absence of rail and air network and told that there is urgent need to connect maximum tribal areas with bus services to provide vehicle facilities in remote area of the state. He said the centre has agreed to fund the project as central assistance. Thakur Singh Bharmouri met Union Tribal Affairs Minister V. Kishore Chandra Deo in New Delhi and asked for liberal financial assistance. Minister was accompanied by Himachal Road Transport Corporation (HRTC) vice chairman Kewal Singh Pathania. Union Tribal Affairs Minister appreciated the measures taken by the State Government for development of tribal areas of the State and said that development of tribal areas in Himachal Pradesh had become role model for other States of the country. He said that the road network in tribal areas was the only source of connectivity with rest of country and it was need of the hour to provide more transportation facilities for the development of such areas. 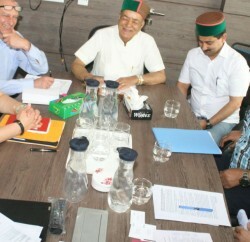 He said that Deo had agreed to visit tribal areas of Pangi and Bharmour in the month of June to assess the impact of various developmental projects in tribal areas besides, he would also hold a high level meeting with Chief Minister Virbhadra Singh, representatives and officers of tribal area for seeking their views and suggestions to expedite the pace of development so as to adopt corrective policy decisions on the level of Government of India, keeping in view of ground realities.